"Maffeo Barberini" redirects here. For his great-nephew, see Maffeo Barberini (1631-1685). Pope Urban VIII (Latin: Urbanus VIII; baptised 5 April 1568 – 29 July 1644), reigned as Pope from 6 August 1623 to his death in 1644. He expanded the papal territory by force of arms and advantageous politicking, and was also a prominent patron of the arts and a reformer of Church missions. However, the massive debts incurred during his pontificate greatly weakened his successors, who were unable to maintain the papacy's longstanding political and military influence in Europe. He was also involved in a controversy with Galileo and his theory on heliocentrism during his reign. 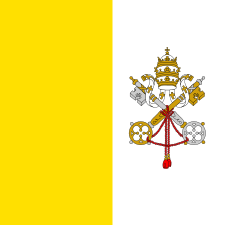 He is the most recent pope to date to take the pontifical name of Urban upon being elected as pope. Circa 1598 painting of Maffeo Barberini at age 30 by Caravaggio. He was born Maffeo Barberini in April 1568 to Antonio Barberini, a Florentine nobleman, and Camilla Barbadoro. His father died when he was only three years old and his mother took him to Rome, where he was put in the charge of his uncle, Francesco Barberini, an apostolic protonotary. At the age of 16 he became his uncle's heir. He was educated by the Society of Jesus, ("Jesuits") and received a doctorate of law from the University of Pisa in 1589. 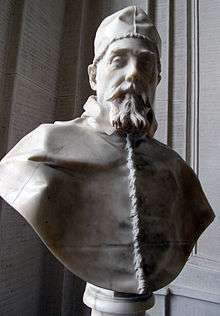 In 1601, Barberini, through the influence of his uncle, was able to secure from Pope Clement VIII appointment as a papal legate to the court of King Henry IV of France. In 1604, the same pope appointed him as the Archbishop of Nazareth, an office joined with that of Bishop of the suppressed Dioceses of Canne and Monteverde, with his residence at Barletta. At the death of his uncle, he inherited his riches, with which he bought a palace in Rome which he made into a luxurious Renaissance residence. 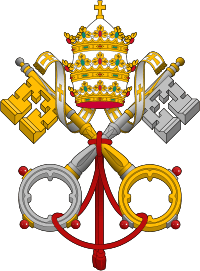 Pope Paul V also later employed Barberini in a similar capacity, afterwards raising him, in 1606, to the order of the Cardinal-Priest, with the titular church of San Pietro in Montorio and appointing him as a papal legate of Bologna. On 6 August 1623, at the papal conclave following the death of Pope Gregory XV, Barberini was chosen as Gregory XV's successor and took the name Urban VIII. The new Pontiff is 56 years old. His Holiness is tall, dark, with regular features and black hair turning grey. He is exceptionally elegant and refined in all details of his dress; has a graceful and aristocratic bearing and exquisite taste. He is an excellent speaker and debater, writes verses and patronises poets and men of letters. Urban VIII's papacy covered 21 years of the Thirty Years' War, (1618-1648), and was an eventful one even by the standards of the day. He canonized Elizabeth of Portugal, Andrew Corsini and Conrad of Piacenza, and issued the papal bulls of canonization for Ignatius of Loyola (founder of the Society of Jesus,"Jesuits") and Francis Xavier, (also a Jesuit ) who had been canonized by his predecessor, Pope Gregory Xv. Despite an early friendship and encouragement for his teachings, Urban VIII was responsible for summoning the scientist and astronomer Galileo to Rome in 1633 to recant his work. Urban VIII practiced nepotism on a grand scale; various members of his family were enormously enriched by him, so that it seemed to contemporaries as if were establishing a Barberini dynasty. He elevated his brother Antonio Marcello Barberini (Antonio the Elder) and then his nephews Francesco Barberini and Antonio Barberini (Antonio the Younger) to Cardinal. He also bestowed upon their brother, Taddeo Barberini, the titles Prince of Palestrina, Gonfalonier of the Church, Prefect of Rome and Commander of Sant'Angelo. Historian Leopold von Ranke estimated that during his reign, Urban VIII's immediate family amassed 105 million scudi in personal wealth. Urban VIII was a skilled writer of Latin verse, and a collection of Scriptural paraphrases as well as original hymns of his composition have been frequently reprinted. The 1638 papal bull Commissum Nobis protected the existence of Jesuit missions in South America by forbidding the enslavement of natives who were at the Jesuit Reductions. At the same time, Urban VIII repealed the Jesuit monopoly on missionary work in China and Japan, opening these countries to missionaries of other orders and missionary societies. Urban VIII issued a 1624 papal bull that made the use of tobacco in holy places punishable by excommunication; Pope Benedict XIII would repeal the ban one hundred years later. Urban VIII's military involvement was aimed less at the restoration of Catholicism in Europe than at adjusting the balance of power to favour his own independence in Italy. In 1626, the duchy of Urbino was incorporated into the papal dominions, and, in 1627, when the direct male line of the Gonzagas in Mantua became extinct, he controversially favoured the succession of the Protestant Duke Charles of Nevers against the claims of the Catholic Habsburgs. He also launched the Wars of Castro in 1641 against Odoardo Farnese, Duke of Parma and Piacenza, whom he excommunicated. Castro was destroyed and its duchy incorporated into the Papal States. Urban VIII was the last pope to extend the papal territory. He fortified Castelfranco Emilia on the Mantuan frontier and commissioned Vincenzo Maculani to fortify the Castel Sant'Angelo in Rome. Urban VIII also established an arsenal in the Vatican, an arms factory at Tivoli and fortified the harbour of Civitavecchia. Urban VIII and his family patronized art on a grand scale. He expended vast sums bringing polymaths like Athanasius Kircher to Rome and funding various substantial works by the sculptor and architect Bernini who was particularly favored during Urban VIII's reign. As well as several portrait busts of Urban, Urban commissioned Bernini to work on the family palace in Rome, the Palazzo Barberini, the College of the Propaganda Fide, the Fontana del Tritone in the Piazza Barberini, the baldacchino and cathedra in St Peter's Basilica and other prominent structures in the city. Numerous members of Barberini's family also had their likeness caught in stone by Bernini, such as his brothers Carlo and Antonio. Urban also had rebuilt the Church of Santa Bibiana and the Church of San Sebastiano al Palatino on the Palatine Hill. The Barberini patronised painters such as Nicolas Poussin and Claude Lorrain. One of the most eulogistic of these artistic works in its celebration of his reign, is the huge Allegory of Divine Providence and Barberini Power painted by Pietro da Cortona on the ceiling of the large salon of the Palazzo Barberini. A consequence of these military and artistic endeavours was a massive increase in papal debt. Urban VIII inherited a debt of 16 million scudi, and by 1635 had increased it to 28 million. 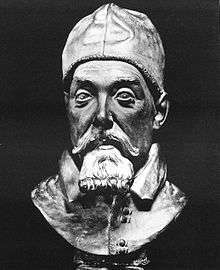 According to contemporary John Bargrave, in 1636 members of the Spanish faction of the College of Cardinals were so horrified by the conduct of Pope Urban VIII that they conspired to have him arrested and imprisoned (or killed) so that they could replace him with a new pope; namely Laudivio Zacchia. When Urban VIII travelled to Castel Gandolfo to rest, the members of the Spanish faction met in secret and discussed ways to advance their plan. But they were discovered and the pope raced back to Rome where he immediately held a consistory and demanded to know who the new pope was. To put an end to the conspiracy, the pope decreed that all Cardinal-Bishops should leave Rome and return to their own churches. With the Spanish plan having failed, by 1640 the debt had reached 35 million scudi, consuming more than 80 percent of annual papal income in interest repayments. Urban VIII's death on 29 July 1644 is said to have been hastened by chagrin at the result of the Wars of Castro. Because of the costs incurred by the city of Rome to finance this war, Urban VIII became immensely unpopular with his subjects. 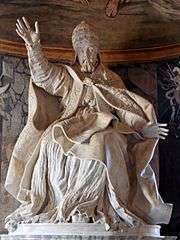 On his death, the bust of Urban VIII that lay beside the Palace of the Conservators on the Capitoline Hill was rapidly destroyed by an enraged crowd, and only a quick-thinking priest saved the sculpture of the late pope belonging to the Jesuits from a similar fate. 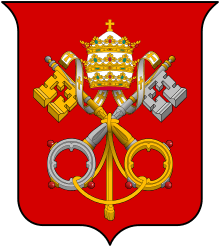 Following his death, international and domestic machinations resulted in the papal conclave not electing Cardinal Giulio Cesare Sacchetti, who was closely associated with some members of the Barberini family. Instead, it elected Cardinal Giovanni Battista Pamphili as his successor at the papal conclave of 1644, who took the name of Innocent X.
Pope Urban VIII did make a public statement about private revelations and their dissemination in the Catholic Church in his Constitution, Sanctissimus Dominus Noster of 13 March 1625. Urban VIII is a recurring character, not quite a major character but definitely more than a minor one, in the Ring of Fire alternate history hypernovel by Eric Flint et al. where he is favorably portrayed. He is especially prominent in 1634: The Galileo Affair (in which he made the fictional Grantville priest, Larry Mazzare, a cardinal), and in 1635: The Cannon Law, and 1635: The Papal Stakes. 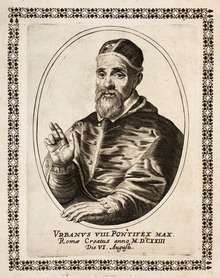 Wikimedia Commons has media related to Urbanus VIII. 1 2 Weech, William Nassau (1905). URBAN VIII: Being the Lothian Prize Essay, 1903. London: Archibald Constable & Co. Ltd. pp. 1–128. Retrieved October 31, 2014. 1 2 3 Ott, Michael T. (1912). "Pope Urban VIII". The Catholic Encyclopedia. XV. New York: Robert Appleton Company. Retrieved 2007-09-07. ↑ Keyvanian, Carla. “Concerted Efforts: The Quarter of the Barberini Casa Grande in Seventeenth- Century Rome.” Journal of the Society of Architectural Historians 64, no 3 (2005): 294. ↑ Mooney, James (June 1910). "Catholic Encyclopedia Volume VII". Robert Appleton Company, New York. Retrieved 2007-06-07. ↑ Joel S. Panzer, The Popes and Slavery, Staten Island, New York, Society of St. Paul, 1996, pp.89-91. 1 2 van Helden, Al (1995). "The Galileo Project.". Rice University. Retrieved 2007-09-07. ↑ Gately, Iain (2001). Tobacco: A Cultural History of How an Exotic Plant Seduced Civilization. Simon & Schuster. ISBN 0-8021-3960-4. ↑ Cutler, Abigail. "The Ashtray of History", The Atlantic Monthly, January/February 2007. ↑ Duffy, Eamon (1997). Saints and Sinners: A History of the Popes. Yale University Press. ISBN 0-300-09165-6. ↑ Fr. Peter Stravinskas, The Catholic Answer Book 4 (pgs. 96-7).